Who doesn’t love to use free WiFi hotspots? They can be found at airports, malls, hotels, restaurant, café, and coffee shops. They are available to anyone. Users around the world regularly use them without knowing its demerits. You may never know what security threat is awaiting to harm you when you use Public Wi-fi. When using Public WiFi there are different threats lurking around. There is a possibility that other person who is using the same Public WiFi as you, may have hacked it and is currently stealing your data. 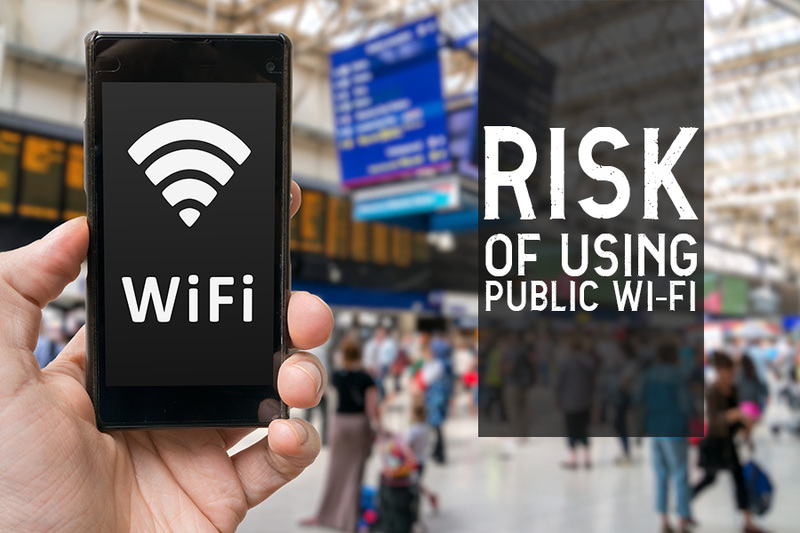 We have listed risks that may be involved when using Public WiFi. Hackers can distribute malware using a compromised Public WiFi hotspot. Hackers can use vulnerabilities present in the network, software or in Operating System itself. After injecting the malware, the hackers can perform any action on the system like stealing data, encrypting data and other actions. Malware can also be used for different malicious activities and they are created according to the attack hackers wants to perform. There is special software that are available using which a hacker can monitor network activity. If the data you enter is not encrypted then it can be accessed by the criminals using the software. All your information that passes over the network will be accessed by the software that hackers install. Sniffing and Snooping can be used to get all the information you are entering, and this information can be used for all sorts of illegal activity. Information that is sent to the router from your system should be encrypted. If the information is encrypted then it can only be accessed by the person who has the key for it. And if the information is unencrypted then the information can be accessed by anyone easily. You can encrypt your data using the settings in your router. Some hotspots are already hacked and they are configured in such a way that once you have connected to the network it starts to send all the information to the hackers. Attackers hack a hotspot that is used by most of the people, and after hacking they start stealing all the information which passes through them. Criminals also create fake hotspots; these have the same name as that of the genuine organization. User will unknowingly connect to these fake hotspots and becomes the victim. Once connected, all the sensitive information is transferred to the hackers. Also Read: 10 Misnomers About Antivirus You Probably Believe! When connected to public WiFi always be cautious. There are hackers lurking everywhere, ready to attack your device and steal your information. Users should take security measures to safeguard themselves from attacks. Do not try to login in to your banking accounts or your social media accounts when using public WiFi.